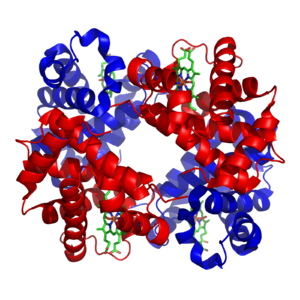 3-dimensional structure of hemoglobin, a globular protein. Globular proteins are a common type of protein. They are one of three types of protein. The others are fibrous and membrane proteins. Their structure is a result of protein folding. They are made of polypeptide chains folded into a compact sphere shape. They are soluble in water because of the hydrophilic ('water-loving') side chains that project from the outside of the molecules. They play an important role in metabolic reactions. Enzymes, by catalyzing organic reactions taking place in the organism in mild conditions and with a great specificity. Different esterases fulfill this role. Messengers, by transmitting messages to regulate biological processes. This function is done by hormones, i.e. insulin etc. Regulation of other molecules is also done by globular proteins rather than fibrous proteins. Structural proteins, e.g., actin and tubulin, which are globular and soluble as monomers, but polymerize to form long, stiff fibers. Globular proteins include myoglobin and hemoglobin. Globulins are all globular proteins except albumins. They have higher molecular weights than albumins. They are insoluble in pure water but dissolve in dilute salt solutions. Some globulins have important function as antibodies, others are responsible for the transport of lipids, iron or copper in the blood. Wikimedia Commons has media related to Globular proteins. This page was last changed on 2 June 2017, at 19:00.